Today, Robert Ferl gave a seminar on space biology at the Princeton Environmental Geology and Geochemistry Seminar and it was so cool that I wanted to post about it here! Robert is an expert on how plants respond to changes in gravity and has led experiments to study how Arabidopsis responds to parabolic flight campaigns (aka a vomit comet) and life on the International Space Station. Now, it is pretty clear that zero g is probably one of the coolest “field sites” you could work at but what really got me excited was the amount of knowledge we can gain from such a small plant and the sophisticated methods that were being used. So why Arabidopsis? Well, unlike the single celled bacteria and archaea I study deep underground, Arabidopsis are multi-cellular eukaryotes with differentiated tissue that drastically change morphology over 5-7 days (e.g. seed to sprout to flowering). On top of that we have a tremendous wealth of knowledge on the physiology of Arabidopsis–not to mention a fully sequenced, well curated genome ;). By placing these plants into zero gravity, we are exposing them to something completely new and can monitor their response all the way down to the molecular level. Prior to work Robert presented, it was generally accepted that the direction of root growth was dependent on gravity yet, in space, the change in gravity did not have an effect on root growth. In fact, when Robert and colleagues compared the gene expression between the life at zero g and on earth, the change in expression was less than the change observed when you subject Arabidopsis to changes in amount of water fed! As you can imagine, getting RNA back from space is a daunting task, so scientists, including Robert, have been developing a way to monitor change in expression during zero gravity flight/on the space station with only a camera (below). What they do is tag promoters of interest with flourescent reporters and then, while in flight or on the station they can monitor where certain genes are getting turned on and off. This macro-level information combined with RNA data provide a powerful tool kit to truly begin to understand how organisms respond to space flight and zero gravity! For more on Robert’s work check out the SpacePlants blog! yeah for space biology! 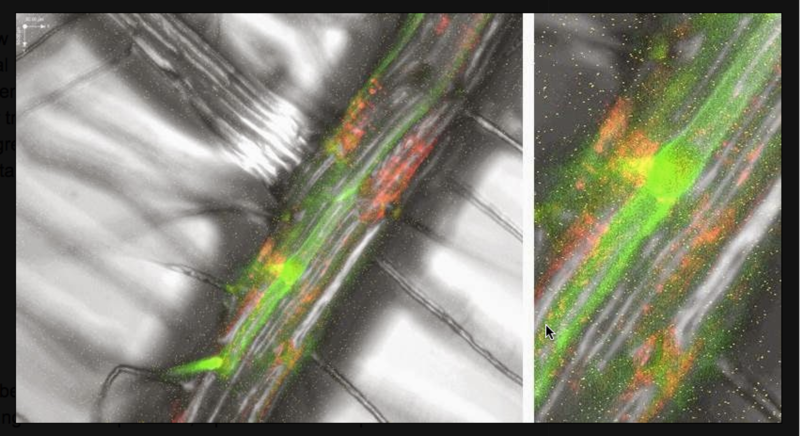 one can only imagine if the plant responds that quickly then an experiment looking at plant-rhizosphere bacterial interactions could be fascinating. Ferl also told me that they grew Arabidopsis at Mars atmospheric pressures. Incredible. …they also have plans to send some mature plants (they send seeds to the ISS) on a Virgin Gallactic flight to see how they respond to as gravity changes! The parabolic flights only have ~30s of weightlessness whereas with the Virgin Gallactic flight, they will have minutes to study and monitor the response! The Week of Mars: Is the red planet habitable?